Ocean Hotels is a family-owned hotel and resort company located on the south coast of Barbados. From Sea Breeze Beach House, an all-inclusive property on Maxwell Beach to Ocean Two Resort & Residences, a four diamond oceanfront property on Dover Beach to South Beach Hotel, a chic boutique hotel on Accra Beach, each Ocean Hotels property offers unique 4-star experiences. Filled with memorable moments that are perfect for family holidays and romantic getaways, our hotels invite you to experience warm and welcoming luxury when you plan your next visit to Barbados. Sea Breeze Beach House offers a luxurious yet friendly all-inclusive resort experience for both adults and families in exciting Barbados. 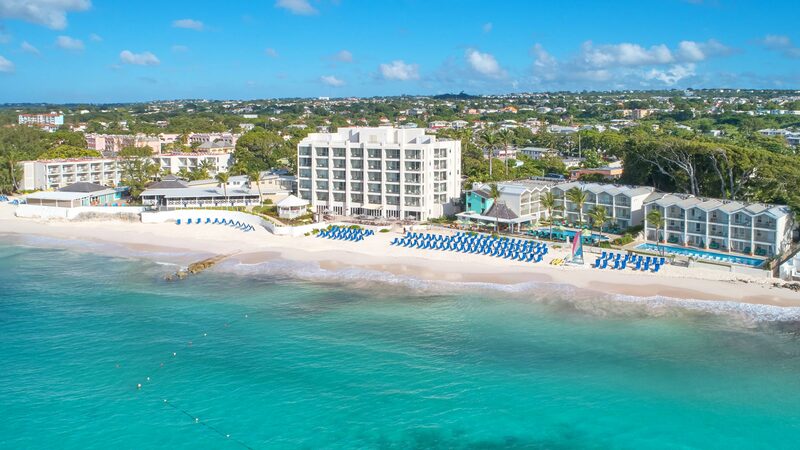 With just 122 rooms set on 2.5 acres of pristine beaches and lush tropical gardens with incredible views of the South Coast, you'll find spacious, colorful rooms and suites in chic Barbadian designs. Enjoy six delectable dining options, five bars offering custom rum and tropical cocktails, three sparkling pools, including adults only, lap and family, complimentary beach, water activity and pool services, and stunning beachfront wedding, vow renewal and reception venues. Sassy, stylish and filled with personalized services, Sea Breeze Beach House is the perfect place for an incomparable Bajan "beach house" experience. For Sea Breeze Beach House Policies please click here. Ocean Two Resort & Residences offers affordable luxury in one of the world's most beautiful islands. With luxuriously appointed suites and stunning sea views, our resort prides itself on our beautiful beach and restaurants. Guests enjoy a panorama rooftop patio featuring a plunge pool, fitness center, complimentary pool and beach drink service, water sports, a concierge and complimentary Wi-Fi. Ocean Two has received prestigious awards, including Trip Advisor's Certificate of Excellence consistently since 2011. Ocean Two is also #12 on Trip advisor's top hotels in all of the Caribbean. For Ocean Two Resort and Residences Policies please click here. South Beach Hotel is a newly renovated, 4 star hotel offering complimentary breakfast, chic residential style suites, and a breathtaking location on the Caribbean Sea. Situated on the vibrant South Coast on Accra Beach, our hotel is within walking distance to many restaurant, bars, shops and the famous 2 mile boardwalk, and is just a few minutes from the exciting nightlife of St. Lawrence Gap. This intimate boutique hotel is the perfect Caribbean getaway for families, couples and groups offering excellent value and comfort while you enjoy the beauty and adventure of Barbados. For South Beach Hotel Policies please click here. Sea Breeze Beach House is committed to being a responsible corporate and community citizen in support of a number of different charities, environmental initiatives and educational programs to further develop our community that we grow in. We are proud members of Pack for a Purpose, an initiative that allows travelers like you to make a lasting impact in the community at your travel destination. If you save just a few kilos of space in your suitcase and bring supplies for our chosen project, Variety - The Children's Charity of Barbados , you'll make a priceless impact in the lives of our local children and families. On arrival just hand over the supplies to us and we will deliver them to the Charity on your behalf. Please click here to see what supplies are needed for our project. Do you have what it takes to work in paradise? At Sea Breeze Beach House, our success relies on the strength of the people we employ as our employees distinguish us. Therefore, we focus on attracting and retaining employees who demonstrate a strong sense of passion for careers in the hospitality industry. We're dedicated to promoting an environment where our colleagues feel motivated and challenged by their daily activities to further develop their creativity while on the job. If you are interested in joining our team, please contact us at [email protected] for more information.